The Centre provides knowledge and advice on flora and fauna for the sustainable management of terrestrial biodiversity as well as agricultural and urban landscapes. threatened plants and animals – biology and management. 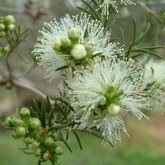 This project aims to progress taxonomic knowledge of the eucalypts, to provide conservation assessments of newly described species and to investigate the effects of fragmentation on population and pollination processes. Commencing initially in 1978, the aim of this project was to establish an inventory of WA eucalypts, documenting their distribution, and assessing their conservation status. This has since developed into collaborative studies with several colleagues, and has provided insights into a number of aspects of eucalypt systematics, biogeography, evolution and ecology relevant to ensuring conservation of these important trees, dominant in so much of Western Australia's vegetation. This project focuses on granite outcrops in the southwest Western Australian and Greater Cape biodiversity hotspots, using them as a system to investigate biogeographically and evolutionary questions. About 15% of the earth's continents consist of granite, which may outcrop in the form of inselbergs - ranges, ridges and isolated hills - that stand abruptly from surrounding terrain, like islands in a sea. Most commonly, granite outcrops appear as dome-shaped hills with bare rock exposed over much of their surfaces. The water catchment so formed combined with a diversity of microhabitats, make granite outcrops havens for biodiversity world-wide. culturally, being vital for aboriginal, colonial and contemporary peoples alike. This project aims to achieve a cross-disciplinary synthesis of current knowledge on granite outcrops, and to distil effective guidelines for conservation managers. Special focus is on Australian and South African outcrops, but global syntheses are being prepared in collaboration with researchers from around the world. This project aims to systematically assess the horticultural potential of southern Western Australia's diverse tuberous flora and to start to commercialise promising species as new vegetable crops. Western Australia's flora contains an extraordinary number of species that form root tubers. Over 85% of 153 tuberous species recorded in Western Australia occur in the State's South West. This diversity provides an unparalleled resource from which new horticultural crops can be developed. The diversity of the flora is of international significance but it has not been surveyed for potential vegetable crops. A demand for native vegetable products was highlighted at the Native Foods Seminar held at the Western Australian Muresk Institute of Agriculture (April 2000) where chefs and suppliers of native foods identified that their industry needed native vegetable foods that could replace traditional vegetables.